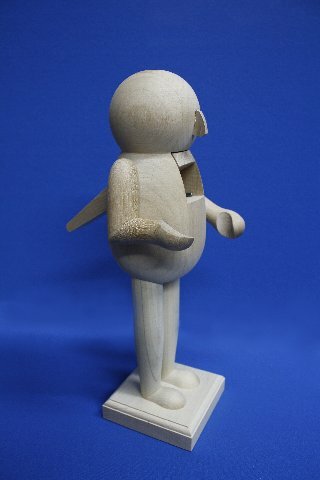 Smokey the Nutcracker was created as a retirement gift for my former supervisor, Cindy Lane. She has a collection of nutcrackers that she loves and Smokey just seemed to be a fit addition. 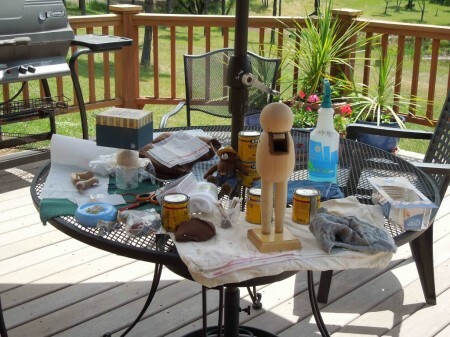 He started with a wooden base created by John Bruce of Bruce’s Woodworks in Draper, Utah. John generously sent various pictures of wooden parts options and suggestions via email as we worked out what he could build me for a base. The wooden soon-to-be-Smokey image is courtesy of Bruce’s Woodworks. 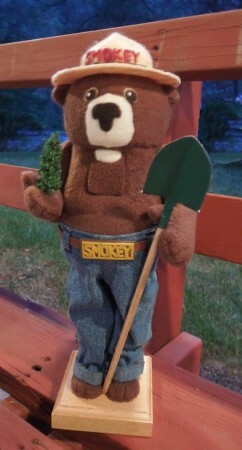 Once Smokey arrived, I set about creating patterns for his jeans, head, body, feet, ears, and arms. I used fleece for body parts – cutting and sewing and trimming again and again to get the fit I wanted. When it wasn’t too hot, I worked outside on the table top studio. 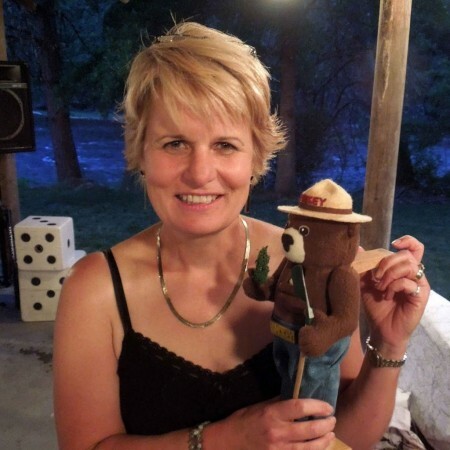 Smokey’s hat is wet felted – think top of a light bulb taped to a ring of plastic – using a tan wool pre-felt with merino wool roving on top of that. 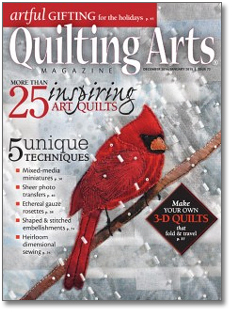 Once I had the general shape and size right, I let it dry then soaked it with fabric stiffener. I stalled the drying of the round part of the hat by covering it with plastic. Once the brim was dry, the hat came off of the form and I made the 4 dents in the top. When that was dry, I trimmed the rim edge, added a ribbon and cut red felt letters out of stiffened felt. Smokey’s nose is needle felted using craft felt. I went to the internet to see how bear noses were patterned. I also found instructions for creating your own patterns for doll clothes. The belt is cut from a thrift store belt and the buckle is crafted from polymer clay. 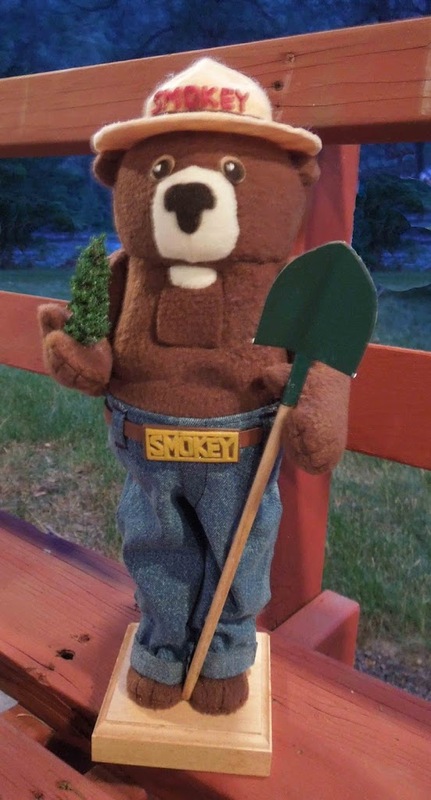 Smokey is holding a purchased and altered tree since his new owner was a Nez Perce-Clearwater National Forest Vegetation Staff Officer (aka Timber Beast). 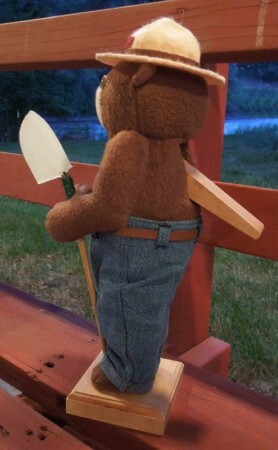 If you axe me, he might not look right without his shovel! Here is Cindy and Smokey the NutCracker.